What. People covet a BlackBerry again? Analysis BlackBerry loyalists may despair – but for the first time in a very long time, BlackBerry has been showered with praise for a new device. While Reddit is no bellwether of mainstream opinion, the Android-based Priv (which rhymes with "spiv," not "reprieve") officially announced on Friday has received far more enthusiasm than any 'Berry in recent years. "Obviously, it runs Google," said BlackBerry CEO John Chen, in a Freudian slip. Perhaps what Chen meant to say was "it runs Android really well" – or perhaps "this phone runs Google's Play Store," for modern BlackBerrys have "run Google" for years. But with only varying degrees of success, and only by jumping through a few hoops. It's a reminder that "open" doesn't mean freedom, and that Google's tight control over its nominally "open" and "free" OS ensures that it maintains an iron grip over the market. "Everybody loves BlackBerry 10, they really do," Chen insisted on Friday, "but there's not enough apps." "If I could put all the apps on BlackBerry 10 then that would be a smashing success. But I can't afford to do that, for all the practical and logistical reasons. So this is the best thing I could do." RIM obtained an Android runtime when it acquired QNX, and shortly after the deal was done, promised that the runtime (or 'Player') would appear in its tablets and next generation of phones. But to run on these versions of the Player, the Android .APK binary had to pass a compatibility check, becoming transformed into a .BAR file. When BB10 launched, much later than initially hoped, in January 2013, it gave the new platform a bunch of rapidly converted Android apps it wouldn't otherwise have, such as Skype. Adding more Android APKs to your device was possible but cumbersome. Sketchy online sites popped up, inviting you to upload an APK, and spitting a BAR file back at you. Then with the aid of a dead chicken and a few voodoo incantations, the BAR could be side loaded to the BB10 device. With a bit of luck, it might even run. A clever hack, which added the ability to execute Android Linux binary extensions, increased compatibility enormously. BlackBerry was able to download many (in fact, most) Android apps without conversion, and execute them in place. A year ago BlackBerry blessed the arrangement by baking Amazon's App Store into all new BlackBerrys. But compatibility was still some way short of 100 per cent. That's because over the years, Google had been moving more platform functionality into a binary blob called the GMS (for Google Mobile Services) suite. This requires a separate license to Android, and if you wanted Google's apps, you needed to pass compatibility tests, which were typically administered by commercial third parties. The GMS blob contained Google authentication, YouTube, Maps, Google+, and a bunch of other apps and services. Application developers were encouraged to use the GMS services rather than an open API. The result was that compatibility on phones without the GMS blob began to diminish. A laborious workaround was devised involving patching. Microsoft is conceptually doing something very similar with Project Astoria, with Microsoft's own videos explaining how it performs in-flight SDK re-routing, so a call to a Google maps API, for example, will be diverted to a Microsoft maps API. So running Android brilliantly wasn't enough. It needed to be a Google phone, and that's what the BlackBerry Priv is. Chen is not far off. For almost three years BlackBerry has been trying to sell a BlackBerry phone with Google-ish extensions. The market has spoken. Now it's trying to sell a Google phone with BlackBerry extensions. The strategy – slow death for BB10? John Chen has been trying to convert BlackBerry to a software and security services company since he took the deck of the burning ship two years ago. Remember that BlackBerry posted a loss of $5bn in the earnings announced in December 2013. But the part of BlackBerry that was responsible for the eye-watering write downs was also the same part that was generating most of its income. BlackBerry sold 6m phones in the quarter ending December 2013, most (5m) of which were legacy BlackBerrys, not BB10 devices. Once the sales of old BBOS7-based BlackBerrys dried up, the failure of BB10 was starkly apparent. The most recent quarter shifted just 800,000 BB10 devices. Recently, rivals have sprung up offering enterprises and security-conscious consumers what is essentially the BlackBerry proposition – a secured Android, with greater app compatibility. One is Silent Circle, the Phil Zimmermann-backed startup, and its BlackPhone 2 is available today offering partitioned workspaces (a clone of BlackBerry's Secure Work Space), and cryptographically secured calls (a clone of BlackBerry's SecuSmart, as endorsed by Chancellor Merkel). 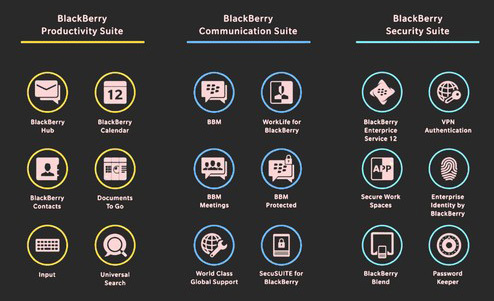 Given that BlackBerry has a rich stack of enterprise-useful software, it had a choice of pulling out of hardware completely and moving into licensing the software, or at least giving it one final shot, with a security-focused Android handset. The BlackBerry stack has goodies such as VPN authentication, secure document management, and WorkLife, a virtual SIM service. All this means BlackBerry compares favorably with rivals like BlackPhone, and has the advantage of being able to leverage BlackBerry's proprietary global network. It should even be able to compete on price. The BlackPhone 2 is $799. No price has yet been set for the Priv.